Martin Dwyer seemed to have the world at his feet when he won the 2006 Derby aboard Sir Percy. However, he has since gained just one more Group 1 win (aboard Nayarra in the 2011 Gran Criterium in Italy) and in 2012 and 2013 failed to break the 50-winner per year mark that he had managed in each of the previous 12 seasons. He began his career at the age of 15, when he started working for trainer Ian Balding. He finished runner-up in the apprentice jockeys’ championship in 1996 and six years later notched his career best tally of 106 winners. He teamed up with Balding’s son, Andrew, to land his first Group 1 victory aboard Casual Look in the 2003 Oaks and the same Balding-Dwyer combination proved potent in the following ten months, particularly with Phoenix Reach, who won them big international races in Canada, Hong Kong and Dubai. A broken ankle in late 2010 kept him out of the saddle for four months and another dark moment came in early 2013 when he was suspended for eight months by the stewards in Mumbai, India – a suspension that was never ratified by the British authorities. 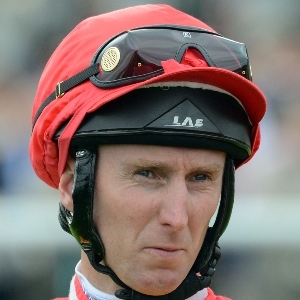 On the brighter side, Dwyer has twice won the Flat Ride Of The Year at the Professional Jockeys’ Association Awards – for winning the Jockey Club Cup on Persian Punch in 2003 and for that Derby-winning ride three years later. Married to Claire, daughter of trainer William Muir, he has two children, Joseph and Daisy. He finished runner-up on Stepper Point, both times to Sole Power, in the 2014 King’s Stand Stakes and the 2014 Coolmore Nunthorpe Stakes.